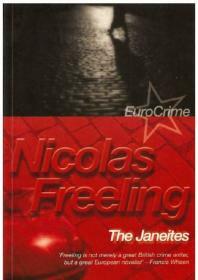 Where has Nicolas Freeling been all of my life? I recently finished The Janeites, the last book he wrote before he died in 2003. Oh woe. Now I need to track down the rest of his books, starting with Love in Amsterdam starring Inspector Van Der Valk. When I started The Janeites I thought I'd stumbled upon a weird or badly edited novel. So I slept on it and started again the next day. Within two chapters I never wanted to the leave the world of Dr Ray Valdez and William and Josephine Barton - Janeites all three. Ray is "no Superman ... but has a talent for winning. In the research world, where they seek to grip on the crab he is not thought of as an unusual technician. The Oncology people hold him in respect because he has a talent betimes thought uncanny: he can often outguess them when the crab - a champion at this game - looks to be winning.". Library members can borrow The Janeites as an eBook. For assistance call any of our branches.